Born in Madrid in 1966 and currently based in Lucca and Madrid. Sierra enlists the help of ordinary people to produce his work. He seeks to uncover the authoritarian structures hidden within society by staging performances that function in accordance with economic principles, paying participants for their labor and taking black-and-white photos of these performance. 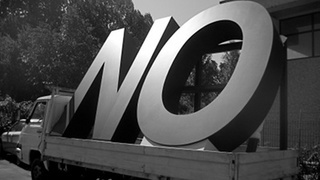 For the Aichi Triennale, as part of his "No Global Tour" series, Sierra plans to exhibit a work in which he parks a truck with an enormous "NO" sign loaded onto its back.